Play your favourite online mp3 streams and podcasts. Store your favourites and play them right away without pc or tablet. Works as stand-alone audio board or module. Dimensions: 83 x 57 mm. MP3 and AAC/AAC+/ADTS (MPEG-4) streams up to 192 kBpS supported. Stores up to 50 presets. 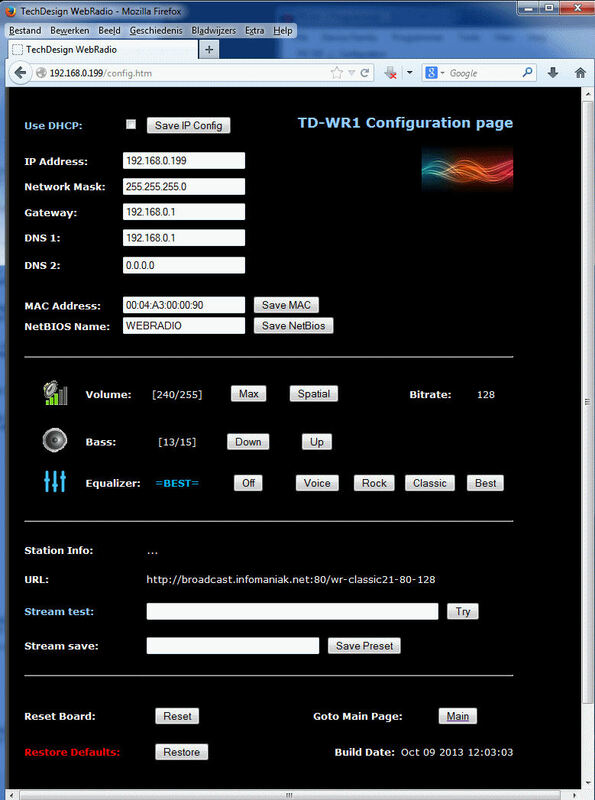 Integrated DHCP client (gets IP-address from router automatically) or fixed IP. High quality optical S/PDIF out, line out and headphone connector. Best sound experience with dedicated audio decoder VLSI VS1063. Presets, settings, volume and equalizer control GUI through webpage hosted by the module. Presets up/down with user buttons for stand-alone usage. Preset selection and volume control through RS232 command interface for audio module mode. Decodes station and artist info where available. Optional LCD with station info. Fitting housing box blue or black available.